People who profess to know nothing of grand opera recognize the "Anvil Chorus" from Verdi's Il Trovatore immediately—if only the Marx Brothers and Bugs Bunny versions. This rousing ensemble number (properly called "Vedi! Le Fosche Notturne"), set in a Romani encampment, features two eight-measure passages where the orchestra mimics the ring of the blacksmiths' hammers as they work. 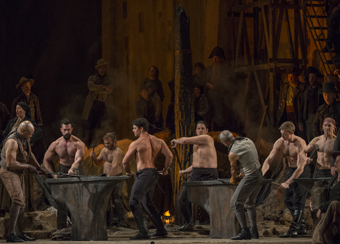 The percussionists in the pit at the Lyric Opera of Chicago get some assistance, however: director David McVicar's staging of the classic scene mandates not only a sextet of shirtless Samsons laboring at the forges, but functional chimes inlaid into the anvils and struck on cue. Coupled with the clash of swords as restless soldiers skirmish with one another, the results make for a stage picture both visually and aurally vibrant. "The anvils are wooden frames covered with canvas painted to look like metal." explains fight director Nick Sandys "The upper surfaces have deep trays cut into them holding two twenty-four-inch tubular bells. These are so loud that everybody wore earplugs at rehearsals, and so the trays are surrounded by felt on either side—and some on top, as well—to muffle the volume. Since the felt gets pounded tissue-flat over the course of the evening, both the music and the prop crews are constantly making adjustments." A pair of chimes seems a precariously small target for industrial-sized sledge hammers, especially given the amount of time necessary for even the strongest men to swing the top-heavy tools through the air. "The men with the ten-pound hammers have to hit the cylinders precisely on the one/three beats—as opposed to the men equipped with the five-pound hammers striking the side anvils on the two/four beats—so we have guide lines drawn on the felt covers to help their aim." The "anvileers" don't sing in the Lyric's production, but musical expertise is still necessary for the roles. "The supernumerary list includes several body-builders who have appeared at the Lyric previously—say, as the executioner in Salome—so Bill Walters, the stage management team's 'Super Boss,' called them first," recalls Sandys, "They all had to participate in some rhythm games along with demonstrating their fight skills, then the music directors held further auditions to ascertain which ones were best from that standpoint." Individual operas are sometimes scheduled with whole weeks between performances—how do these attention-grabbing bit-players keep from forgetting their solos from night to night? "I end the fight call [a slow-motion run-through of all fights before the start of every show] with a warm-up exercise designed to re-acquaint them with the timing, and also remind them to keep the touch light, even with the biggest hammers." He smiles, "The goal is to give the Maestro what he wants!" Il Trovatore continues at the Lyric Opera through November 29.